Imagine8 Enters The Crystal Maze! Cult classic The Crystal Maze continues to pull in partners, with Imagine8 the latest licensee to join the programme for the revamped game show. The Crystal Maze originally aired on Channel 4 from 1990 to 1995, achieving iconic status by pitting teams of contestants against the fiendishly difficult puzzles of the Maze. After a hugely successful Stand Up To Cancer celebrity special in 2016, the show has made a full return to Channel 4 and is now the channel’s #1 entertainment show. 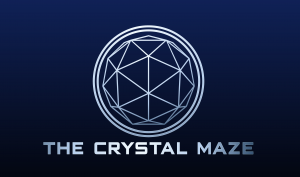 Hosted by Maze Master Richard Ayoade, the new series sees teams face a new range of challenges as they attempt to navigate the Aztec, Medieval, Industrial and Future zones to win crystals that equate to time in the final challenge – the Crystal Dome. Imagine8 has signed to do FSDUs with a range of Crystal Maze-branded products, which adds to a burgeoning programme. Licensing agent Bulldog has also signed up Poetic Brands for an adult apparel range that’s launching this month, as well as Rascals (games and puzzles) and The Hut (mugs, notebooks, coasters, cushions and pillows). In addition, recent ads for PayPal and Specsavers have both featured the brand, whilst the Co-op has been using the theme song. The huge success of the TV show’s relaunch follows in the steps of the sell-out successes of The Crystal Maze LIVE Experiences, real life opportunities for members of the public to play recreations of The Crystal Maze in either London or Manchester. The experiences are sold out months in advance.